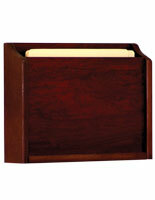 This single pocket organizer, wall mount file holder is typically used in offices and businesses. 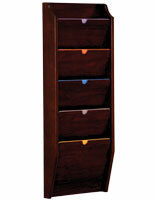 Constructed from solid oak and mahogany laminate, each chart organizer is built to last through years of use. 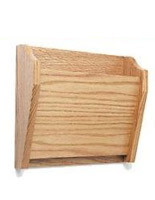 This wall mount file holder, also called a chart pocket, are a popular choice among medical offices to hold patient files that are waiting to be seen. 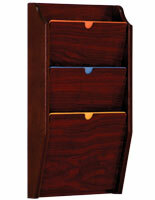 Hang this wood pocket outside each examination room for a uniform look throughout an office. Each wall mount file holder features a slanted design that makes it easier for users to retrieve the contents. The high front panel prevents passersby from seeing any confidential information within the pocket. 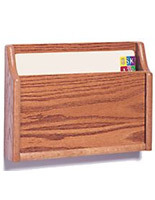 This wall mount file holder is a wooden file organizer that can also be used to hold outgoing mail or inter-office envelopes that need to be distributed. This slanted folder display can hold up to .75" of material. This wall mount file holder is an effective means of keeping an office space looking neat and organized. 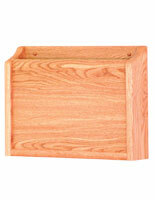 This hanging wood pocket can be purchased in bulk quantities to mount several units side-by-side. Each wall mount file holder includes the necessary hanging hardware. One person can easily hang this wood organizer in a matter of minutes. 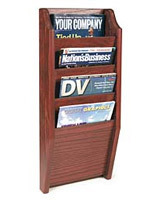 This wall mount file holder with a mahogany finish will match or complement the other wooden fixtures within a business or medical office. 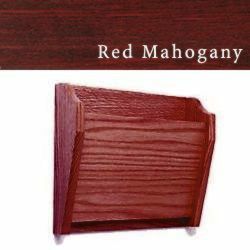 There are several other wood finishes and pocket configurations offered in this online catalog. Buy this wall mount file holder today! It is very nice and looks very professional.